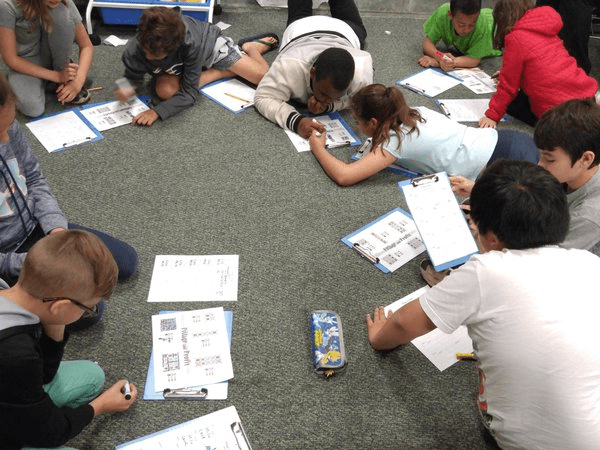 Get students involved and practicing algebra from grade 3 forward. Here are the game sheets for the different grades. PS. The double up and down arrow that you see on the puzzle sheet below means that you can increase or decrease the value of the pictured object. PPS. I now am experimenting with randomizing which students I call upon rather than systematically going through the whole class. The advantage of this technique is that it keeps students who have just been asked focussed because they could be asked again. If there are some students that you really want to ask, you can increase the odds of drawing their name by secretly adding an additional popsicle stick with their name – or removing the names of others. Unlike the grade 3 version, the grade 4 version allows variables to go negative… suddenly all those chicken wings that you stole have gone putrid. Yuk! They are now worth -5 doubloons each!!! Keeping engagement levels high is aided by having additional game boards that are beautiful and enticing. These should be kept secret until they are used. They should not be handed out in the same order for all student pairs. Otherwise the fastest students are always the first ones to have the joy of being given a new sheet. Instead, mix it up a bit. Sometimes let a slower group be the first to get a sheet. Be prepared for students wanting to create their own puzzles and games. This needs to be handled carefully otherwise it can end up in frustration. I tend to err on the side of letting students be creative within constraints. In the example at the end of this video maybe I should have just let the two boys create their own geometric board rather than handing them my own beautifully prepared one. It’s debatable. I’m not sure both students were equally invested the board that one of the boys was drawing, so I think getting them to focus on the algebra and not the board was the correct decision. Alison Hansel algebraically engages grade 5 students with Pillage & Profit.